Though some of the more exotic plants available may be beautiful, native plants are so much more. Not only will they bring aesthetic value to your home, but they will also enrich your yard and make it a beneficial to the environment at large. Let’s take a look at why we love native landscaping. Native landscaping is using the native plants of the local ecosystem in your design plans. The reason why this is so great is because your yard will naturally support the environment rather than working against it. Ecosystems are delicate balances of predators, prey, and various life cycles. When a new species is introduced, we sometimes see the ecosystem get thrown out of whack. When the balance is disturbed, all sorts of problems can arise. Not only that, but exotic plants don’t always have the right constitution for the environment. Tropical plants, for example, won’t handle Maryland’s harsh winters terribly well. They’re destined to struggle and it’s possible that they will die in the process. Rather than risking it, you’re better off planting flowers, bushes, and shrubs that will thrive rather than just survive. Bees are currently having their fair share of difficulties in today’s harsh world. Colonies are collapsing and overall, it looks like bees could use some help. One way that you can support your local pollinators is to plant the fixtures that they need to succeed. Along with bees, native plants also help protect populations of butterflies and birds in the area. This can be nice if you like to look out the window and see nature come to life in your backyard. 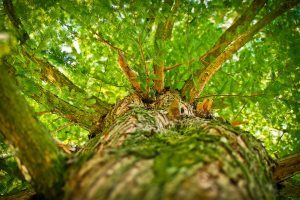 If you’re looking for a way to restore the natural order in your backyard, then call on the specialists at Nelson Tree. We can help you with every aspect of your trees and their care. We can remove dead trees and even diagnose trees that may be sick. Trust in the specialists for your trees, so contact us today to learn more. This entry was posted on Tuesday, November 6th, 2018 at 1:00 am. Both comments and pings are currently closed.